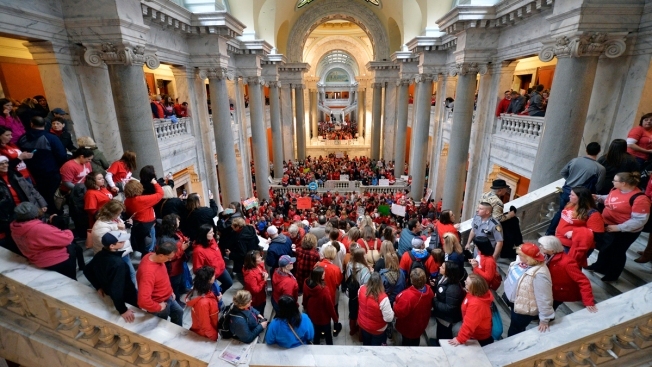 Teachers from across Kentucky fill the state Capitol to rally for increased funding and to protest changes to their state funded pension system, Monday, April 2, 2018, in Frankfort, Ky. 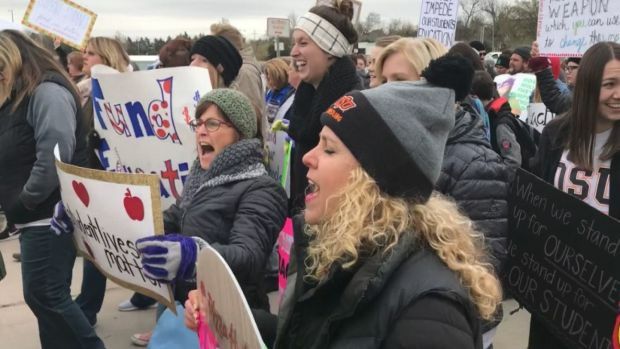 The occupational therapist in Kentucky's second largest school district has been one of the thousands of educators protesting at the state Capitol in recent weeks to oppose changes to their pension system and to ask lawmakers for more school funding. They lost the pension fight, but Friday more than 30 school districts across the state closed so teachers could travel to the Capitol and ask Republican lawmakers to override Bevin's veto of a two-year operating budget that included increased classroom spending. They did. Bevin responded by guaranteeing somewhere a child had been sexually assaulted, ingested poison or used illegal drugs because they were left home along by single parents who could not afford to find child care on short notice. After electing a Republican governor in 2015 and giving the party full control of the state legislature for the first time in 2016, it seemed the GOP had solidified its grip on Kentucky for years to come. But the legislature's rush to change the state's troubled public pension system, coupled with Bevin's burn-the-bridges approach to politics, has led to a wave of protests and prompted at least 40 current and former teachers to run for public office this year — most of them Democrats.